The third-ranked Nebraska volleyball team fell to No. 5 Minnesota, 3-1 (20-25, 25-23, 14-25, 21-25) on Saturday night in front of a crowd of 8,420 at the Bob Devaney Sports Center, the second-largest crowd of the season. The loss dropped the Huskers to 14-2 overall and 5-1 in the Big Ten and snapped NU’s 14-match win streak. Minnesota improved to 12-2 and 6-0 in the Big Ten and is now the only unbeaten team in the Big Ten. Mikaela Foecke had a team-high 16 kills, while Lexi Sun had 12 kills and 15 digs for her second straight double-double. Jazz Sweet added 13 kills, while Lauren Stivrins contributed 10 kills and hit .450. Nicklin Hames had 44 assists and 18 digs, while Kenzie Maloney chipped in 18 digs. Minnesota out-hit the Huskers .280 to .194. The Huskers had an 11-7 edge in blocks with Stivrins leading the way with five. But Minnesota had four aces to Nebraska’s one and out-dug the Huskers, 77-63. Adanna Rollins had 17 kills to lead the Golden Gophers. Taylor Morgan added 13 kills. Set 1: Minnesota jumped out to a 7-2 lead, but the Huskers worked back to within 8-6 after a pair of kills by Stivrins. The Golden Gophers pushed their lead back to four at 13-9, but a solo block and a kill by Sweet drew NU within one, 13-12. Minnesota maintained its lead though after a slew of Husker hitting errors made it 17-12 Gophers. Sun struck for three kills to help the Huskers pull within 20-18, but NU could get no closer than two as Minnesota won 25-20. Set 2: The Huskers went on a 6-1 run to take a 7-3 lead. Foecke and Sun recorded kills, and a solo block by Sun made it 10-5 Huskers. The Golden Gophers chipped away and took a 17-16 lead after a three-point run. After four sideouts, Minnesota went up 20-18 on an Alexis Hart kill. The Gophers led 21-19 when back-to-back blocks by Schwarzenbach – one with Sweet and one with Sun – tied the score at 21-21. 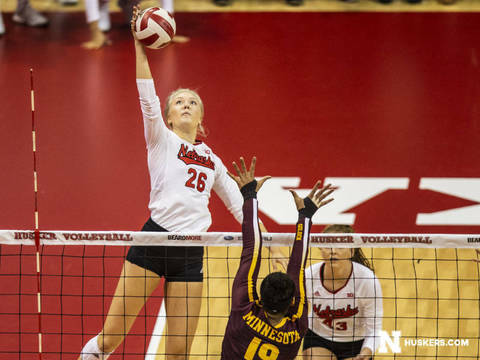 After a timeout, the Huskers won a long rally when Minnesota hit long, but Taylor Morgan answered for the Gophers. Foecke put the Huskers back in front 23-22 with her 10th kill, and a block by Stivrins and Sweet gave NU set point at 24-22. After a service error made it 24-23, Sweet put the set away with a kill. Set 3: The teams went back and forth throughout the beginning of the set, but Minnesota went on an 11-0 run to stake a 23-11 lead. The Gophers went on to win 25-14 to go up 2-1 in the match. Set 4: Minnesota pulled away to an 11-6 lead after a 7-2 spurt and maintained its five-point lead at the media timeout, 15-10. Minnesota led 18-11 when Stivrins posted a kill and an ace around a Sun kill to cut it to 18-14. NU cut it to three, 19-16, on a block by Sun and Schwarzenbach, but the Gophers never let Nebraska get closer than three and clinched the match with a 25-21 win. Up Next: The Huskers host Indiana on Wednesday, Oct. 10 at 7 p.m. Wednesday’s match will be the Huskers’ annual “Pink Night” for breast cancer awareness.